Current U.S.-Cuba relations deny two-way agribusiness trade. Many analysts believe removal of U.S. economic sanctions on Cuba and a democratic freemarket Republic of Cuba would open the door for multi-billion dollar trade and investment in food and agriculture between the two countries. This paper provides background information on U.S.-Cuba food and agricultural trade, and then examines prospects for U.S. and Cuba agribusiness trade under three scenarios: (1) U.S. lifts the travel ban; (2) U.S. removes economic sanctions; and (3) a democratic Cuba adopts a market-oriented economy. In recent years, U.S. legislation has been introduced that would make into law scenarios one and two. The third scenario is a hopeful prospect of the future. Prior to Cuba’s revolution in 1959, there were strong economic relations between the United States and Cuba. Seventy percent of Cuba’s imports were from the United States in 1958. Sixty-seven percent of the country’s exports went to the United States.2 Also, the United States was the principal source of both private and official capital for Cuba. Proximity of the two markets, resulting in reduced transportation duration and costs compared to alternative country sources, was an important factor in trade between the two countries. Complementary import and export markets, also, were important; but U.S. investment in Cuba was perhaps the greatest underlying factor in promoting strong trade relations. U.S. investment fueled Cuba’s sugar and other commodity exports, which generated the foreign exchange needed to import U.S. farm products, as well as other goods. Bilateral relations between the United States and Cuba deteriorated sharply following Fidel Castro’s assumption of power in 1959. In 1961, the United States broke diplomatic relations and in 1962 imposed an embargo on trade and financial relations. On July 8, 1963, the Cuban Assets Control Regulations were issued by the U.S. Government under the Trading With The Enemy Act. In 1996, the Cuban Liberty and Democratic Solidarity Act (“Helms-Burton Act”) further tightened the embargo. Although trade between Cuba and U.S. foreign-based subsidiaries was not legal, according to U.S. law, food products with popular U.S. brands continued to be available in Cuba throughout the 1990s. It was not until January 1999, when President Clinton announced substantial changes in U.S. commercial policy toward Cuba, that prospects improved for food and agricultural exports to Cuba. While there was some question regarding interpretation, the Executive Order President Clinton signed in 1999 permitted U.S. food sales in Cuba to small private farmers, private cooperatives, individual Cuban nationals, private home-based restaurants, nongovernment organizations (NGOs), and the government- formed Basic Units of Cooperative Production (UBPCs). Although sales of food were allowed by the U.S. government, it was nearly impossible for U.S. firms to make logistical arrangements with these “private sector” entities. Therefore, there were no significant sales of food to Cuba under the Executive Order. As a significant agricultural producer, Cuba traditionally has had a positive balance of trade in food and agriculture products. Sugar has been the dominant commodity, not only in agricultural trade, but also in total exports. During the 1990s, however, sugar exports fell and the positive balance of agricultural trade declined. Increased exports of tobacco products and beverages helped to alleviate the downward trend of the food and beverage balance of trade, but the drop in value of food and agricultural exports has been consequential. In 2002, for the first time, Cuba had a negative balance of agricultural trade in the amount of 48 million pesos. The overall balance of trade deficit was nearly two and three-quarter billion pesos. In 1990, at the beginning of the Special Period, Cuba exported agricultural products valued at $4.8 billion, more than five times the value of agricultural imports. In 1991 agricultural exports fell to $2.6 billion and in the following decade hovered around $1 billion until 2002, when they totaled about threequarters of one billion. Agricultural products as a percentage of total exports during the 1990s was around 80%, and sugar accounted for about 90% of the value of agricultural exports (Tables 1 and 2). With the significant loss of foreign exchange from sugar exports, Cuba has had to find other means of generating hard currency to import food and other essential products. Opening dollar stores to the Cuban population and promotion of tourism have been the main approaches. In 2000, the U.S. Trade Sanctions Reform and Export Enhancement Act (TSRA) was signed into law. It was not until July 12, 2001, however, that the implementing regulations were published. One of the primary purposes of TSRA was to require the U.S. Government to license commercial sales of agricultural commodities to purchasers in Cuba. All sales by U.S. companies were to be authorized only in U.S. dollars, on a cash basis—no credit transactions would be permitted. With changes in U.S. policy regarding food and agricultural exports to Cuba, and Cuba’s reduced food supply as a result of tropical storms and other factors, food imports from the United States were initiated in the new century. Initially, Cuba cast aside offers of U.S. food products, including donations for disaster assistance. Following Hurricane Michelle in November 2001, however, Cuba’s food reserve was depleted and Cuba turned to the United States for food, especially bulk commodities such as wheat, soybeans, and rice. Cuba also imported consumer-oriented products, especially poultry meat, for distribution through ration stores and to provide institutional food. In 2001, the United States exported $4.6 million in food to Cuba. Following the U.S. Food and Agribusiness Exhibition in Havana in September 2002, Cuba indicated it would continue a high level of food imports from the United States. In 2002, U.S. food exports to Cuba increased to $140 million, and 2003 exports reached $249 million. During the first quarter of 2004, U.S. agricultural exports to Cuba were running 170% higher year-to-date than in 2003. Cumulative, from December 2001 through May 2004, Cuba had purchased U.S. food products valued at more than a half-billion dollars. U.S. bulk agricultural exports to Cuba from December 2001 through May 2004 totaled $313 million, intermediate product exports were more than $168 million, and consumer-oriented exports reached more than $116 million. Major commodity exports were: poultry meat, $93 million; coarse grains, $85 million; soybean oil, $80 million; wheat, $77 million; soybeans $67 million; and soybean meal, $56 million. Will the current level of U.S. food and agricultural exports to Cuba continue? The answer is largely political and not economic. In the following scenarios, there is no attempt to consider the political aspects of agribusiness trade and investment in Cuba. The scenarios are examined solely from a market viewpoint, and are based largely on studies conducted previously by various U.S. organizations. Legislation proposed in 2003 in the U.S. Congress to lift the U.S. travel ban was approved by the House of Representatives and by the Senate. It was, however, under threat of Presidential veto and was removed in conference from the bill that went to the President for signature. Similar legislation in prior years to lift U.S. travel restrictions had passed the House of Representatives but not the Senate. Action in the U.S. Congress in 2003, therefore, is significant in that it indicates growing support for lifting the travel ban. Since the scenario calls for unilateral lifting of the travel ban and nothing more, U.S. restrictions on export incentives and agribusiness investment in Cuba would continue. The prospects for increased U.S. food and agricultural exports would depend almost entirely on increased tourism in Cuba. Political ramifications, e.g., for Cuba to consider U.S. products more favorably in an effort to influence U.S. policy, are not addressed. It is anticipated that lifting of the U.S. travel ban to Cuba would have immediate impact on tourism in Cuba, and would result in greater need of high-quality food to supply the tourism industry. Eighty-five percent of Cuba’s tourists prior to 1959 were from the United States. That high percentage might not be achieved with lifting of the U.S. travel ban; however, it is likely that a large number of U.S. citizens would visit Cuba. A study by researchers at the University of Colorado at Boulder estimates 1.5 million tourists from the United States within three years after lifting the travel ban.4 A study by Texas A&M researchers, conducted for the Cuba Policy Foundation, states that expenditures of $30 per day for food by U.S. tourists would require $126 million in food imports annually based on 1.5 million tourists staying seven days in Cuba.5 Larger numbers of tourists and higher estimates of dollar food expenditures, whether from the United States or other countries, would result in higher estimates of food import needs. Three estimates were made by Texas A&M researchers based on the level of U.S. tourist food expenditure while visiting Cuba. It was estimated U.S. tourists would spend between $30 and $60 per day on food, excluding beverages. Average menu prices, according to the study report, were analyzed to determine the possible range of meal prices on a daily basis. An intermediate food expenditure of $45 per day was also analyzed. The average length of stay was assumed to be seven days. It was also assumed that 40% of total food expenditures by U.S. tourists would be met by U.S. agricultural exports. Based on estimates by the Texas A&M researchers, it seems credible that lifting the U.S. travel ban could result in doubling current U.S. food and agricultural exports to Cuba—to more than a half-billion dollars—within three years. Lifting the travel ban, also, could have significant impact on demand for beverages, especially U.S. wines. U.S. exporters of other beverages could also expect to gain some share of the increased market. Increased numbers of tourists, whether from the United States or elsewhere, would also increase foreign exchange earnings for the Cuban government. In the food sector alone, dollar earnings from food and beverages sold in dollar stores and tourist hotels could help provide foreign exchange needed to import food. The value of food (includes food produced in Cuba and food imported) sold through dollar stores and tourism is estimated at $650 million to $800 million annually.7 Adding a mark-up of 1.7 for national food and 2.4 for imported food sold through dollar stores and 3.0 for food sold through tourism, Cuba probably recovers most of the foreign exchange needed to import food for the growing tourist industry. In the second scenario, the United States removes the embargo but retains some restrictions affecting U.S. exporters and investors. Cuba does not change its policies. The scenario examines prospects for agribusiness investment in Cuba, as well as increased U.S. food and agricultural exports. In this scenario export incentives for agricultural exports would not be extended to U.S. exporters for food and agricultural shipments to Cuba. Without export credits, it is doubtful U.S. food and agricultural exports to Cuba would increase beyond the impact of lifting the travel ban. Cuba’s foreign debt is estimated at $12 billion and, in addition, Russia has significant debt claims against Cuba. Removal of U.S. economic sanctions would provide only limited encouragement for the international community to extend credit for Cuba to import food. Some U.S. agribusiness exporters might accept the financial risk of extending private credit in an effort to establish trade relations; however, the impact on total trade would be minimal. Agribusiness investment opportunities under this scenario would be permitted; however, no U.S. government incentives would be extended to U.S. agribusiness investors. Without incentives provided by the U.S. government, U.S. investors using their own resources would have to compete with Canadian and European companies already established in Cuba. Approximately 50 international economic associations in agribusiness now operate in Cuba in food processing, production of fresh produce for the tourist trade, and in other agricultural areas. Without a regime change and implementation of new foreign investment policies and regulations, the established foreign companies would have an advantage over new investors. As a result of unilaterally removing economic sanctions on Cuba, it is doubtful there would be significant increase in U.S. agricultural exports beyond the amount projected for lifting the travel ban. Democratization of Cuba, the third scenario, would permit free agribusiness trade and investment between the two countries. The United States would remove all remaining restrictions and a democratic Cuba would advance a free-market economy. In addition to early research carried out by the University of Florida, several studies have been conducted covering prospects for U.S. food and agricultural exports to a free-market Cuba. This section reviews some of the studies (Table 3) and provides additional comments. Values of export estimates are taken largely from a Texas A&M study8 and a study by the U.S. International Trade Commission.9 Potential import quantities are extracted from various studies. Based on consumption of Cuba’s principal food imports in kilograms per person compared to the Dominican Republic, Costa Rica and Venezuela, there are several commodities indicating lower comparative consumption. High market potential is indicated for several commodities, especially, soybean oil, beef, and eggs. Wheat, corn, pulses, soybeans, sunflower oil, pork and dairy products all offer moderate potential for growth. Most of these commodities are grown largely in Northern U.S. states. Southern state products, especially rice and poultry meat, also are identified as having high export growth potential as per capita income in Cuba increases. Other commodities and products, based on FAO food balance sheets, also offer high export growth potential. Cuba’s importation of animal feed, livestock genetics, fertilizers, pesticides, herbicides, and farm machinery all should increase as incomes rise in Cuba. In Fiscal Year 1992, when Cuba was still trading with U.S. subsidiaries in foreign countries, soybean products was the leading export to Cuba, accounting for nearly 40% by value of the consumable exports and more than one-third of all U.S. subsidiary exports. From 2001 (when direct exports were authorized under TSRA) through the first half of 2004, soybean products are again the largest export, accounting for more than 40% of U.S. agricultural exports to Cuba. It seems probable, therefore, that soybean oil, soybean meal and soybeans will account for the highest value category of U.S. agricultural exports to Cuba under normalized trade relations. There is no significant oilseed production in Cuba. Better tasting soy food products need to be introduced in the Cuban market in order to create demand for soybeans for direct human consumption. Such products, because of their nutritional value and good taste, have become popular in the Caribbean market. They have not been marketed in Cuba. Demand for soybean meal for feed use and soybean oil for food use should increase as Cuba’s economy grows. Cuba’s future market for soybean meal will depend largely on Cuba’s ability to access supplies of feed grains, and on protection of poultry meat production in Cuba. Soybean meal imports averaged approximately 277,000 metric tons during the late 1990s, but had reached more than 400,000 metric tons in 1989. In the late 1980s, soybean meal represented more than 90% of the total protein meal (soybean meal, sunflower meal, and some fish meal) imported. 11 Brazil and Argentina were the sole suppliers. Cuba can expect increased domestic supplies of animal fats (mostly tallow and lard) as its livestock industry recovers; however, Cuba will remain highly dependent on imports of vegetable oil. China, Mexico, and Argentina have been the major suppliers of the soybean oil market in Cuba during the past 40 years. The Texas A&M study estimated U.S. exports of soybeans and soybean products at $80 million under conditions of moderate export growth and $179 million under high export growth. (Sunflower oil exports were estimated at $4.5 million and $10.9 million under the two conditions of moderate and high export growth.) In 2003, U.S. exports of soybeans and products totaled $107 million. All of Cuba’s wheat and flour consumption needs are met through imports. Wheat is not grown in Cuba. FAO places per capita consumption of wheat at 56 kilograms per year for the period 1998-2001. In 1988-90, a decade earlier, per capita consumption averaged annually 75 kilograms, more than one-third greater. The relatively low per capita consumption of wheat in recent years indicates a need for Cuba to import more wheat in order to regain the consumption level of the period before the loss of Soviet subsidies. If the per capita consumption level of wheat were to return to 75 kilograms per year, Cuba would import approximately 900,000 metric tons for human consumption. Wheat for feed imports would total about 500,000 tons, if wheat for feed imports returned to the 1989-90 level. Revitalization of the livestock industry and expansion of food industries could be expected under a free-market economy; therefore, Cuba could easily become an importer of 1.5 million metric tons or more of wheat and wheat flour. Estimates from the Texas A&M study place U.S. wheat and wheat flour exports at $56 million under moderate export growth and $140 million under high export growth. In 2003, Cuba imported wheat from the United States valued at $37 million. Substantial growth in the demand for meat, brought about by economic and tourism growth and increased domestic per capita consumption, would provide a basis for greater numbers of livestock and poultry. There would be a sequential demand for larger imports of feed grains. Before loss of Soviet subsidies, Cuba imported substantial amounts of feed grains. In 1989/90 Cuba imported 716,000 tons of corn. Ten years later, imports of corn had fallen to 50,000 tons.15 While cattle production dropped significantly in the 1990s, swine production rebounded from the drop in the early 1990s. Pork production increased as a result of adapting local feedstuffs and less control of markets classified as non-state. Broiler production has not recovered to the extent of swine production, largely because of lack of feed. While Cuba’s livestock and poultry sectors have declined significantly, research institutions have remained viable. Under free-market conditions and the ensuing anticipated economic growth, Cuba’s livestock and poultry production could grow substantially. Along with this growth, would be increased imports of feed grains. The North Dakota State study placed the potential U.S. share of Cuba’s corn market at 99% and projected potential U.S. exports of corn at 254,000 metric tons. Higher per capita GDP growth of 50%, rather than the 30% pre-Special Period level, would project U.S. corn exports at 333,000 tons. Actual imports of corn by Cuba in 1989/90 were more than twice this level. U.S. corn exports are estimated at $9.5 million by Texas A&M under conditions of moderate export growth, and $80 million under high export growth. In 2003, Cuba imported coarse grains from the United States valued at $36 million. Pulses are the edible seeds of peas, beans, lentils, and similar plants having pods. Consumption of pulses in Cuba has been the reverse of most food items. Cuban per capita consumption of pulses increased from 11.5 kilograms per year for 1988-90 to 15.4 kilograms for 1998-2001. FAO data show average production of pulses in Cuba from 1988-90 at 14,000 metric tons, and an import average of 112,000 metric tons per annum. For the 1999-2001 period, Cuban production averaged 50,000 metric tons and Cuba imported an average of 163,000 metric tons. Texas A&M estimated U.S. exports of dry beans to Cuba under circumstances of moderate and high export growth at $20 million and $45 million, respectively. U.S. exports of pulses to Cuba in 2003 were valued at only $1.1 million, but are increasing significantly in 2004. In the 1960s, the average Cuban was consuming more than 20 kilograms of beef per year, one of the highest rates of beef consumption in the world. Cuba’s cattle population was approximately equivalent to the human population. In 1961-89, the average Cuban continued consuming beef at a high level, 17.5 kilograms per year. In 1999-2001, per capita consumption of beef had fallen to 6.6 kilograms, a drop of 62%. Imports of beef and veal from 1961-89 averaged 1,000 metric tons. In 1999-2001, beef imports averaged 1,600 metric tons. Pork imports, on the other hand, averaged about 7,000 tons in 1999-2001. During 1961-89, pork imports were minimal. Consumption of pork, according to FAO data, from 1961-89 averaged 5.4 kilograms per person per year. In 1999-2001, Cubans consumed 13.1 kilograms of pork per person per year. Poultry meat has been the leading export for U.S. agribusiness under TSRA. U.S. exports of poultry meat to Cuba from December 2001 through May 2004 totaled nearly one-fifth of total U.S. exports to Cuba. It is anticipated that poultry meat would continue to be a major export item to Cuba under conditions of a free-market. Private foreign investment in poultry production in Cuba in the future could impact the import market; however, for the next several years Cuba will remain an important poultry meat and egg market for U.S. exporters. Consumption of dairy products (excluding butter) during 1999-2001, according to FAO data, averaged annually 92 kilograms per person. During 1988-90, consumption averaged 145 kilograms and from 1961-89 the average was 138 kilograms. Production dropped from 1.1 million metric tons in 1988-90 to 618,000 tons in 1999-2001. Imports remained relatively stable at 478,000 metric tons in 1988-90 and 440,000 tons annually during 1999-2001. Data on consumption of beef, pork and dairy products indicate a substantial need to increase supplies of these products, either through production and/or importation, to regain consumption levels experienced in prior years. The Texas A&M study estimates exports from the United States of dry milk at $47 million and cheese at $8 million under conditions of high export growth. Although Cuba identifies with all these factors affecting livestock production, the country offers advantages over many other tropical and sub-tropical regions, especially for production of cattle. In the eastern provinces, Cuba has relatively consistent temperatures and a favorable climate for cattle enterprises. The soil is fertile and offers prospects for improved pasture grasses. Since Cuba is an island, it offers opportunity for better control of animal diseases than countries with land borders. While an important market for U.S. swine, sheep, goats, and horses will develop when Cuba has a freemarket economy, the greatest potential market is with cattle, both beef and dairy. Purchases of U.S. cattle by Cuba in 2003 were the first livestock imports of significance since 1961, with the exception of 1990 when Cuba imported livestock valued at $3.5 million. In 2003, Cuba imported live animals from the United States valued at $621,000.17 These were primarily bred dairy heifers raised in the Midwest and exported through Florida ports. Later, a Florida firm sold 250 head of beef cattle (Brangus, Braford and Beef Master) to Alimport, the Cuban state food purchasing agency, valued at $450,000. Shipment was anticipated in 2004. The sale raised the number of U.S. cattle sold to Cuba to approximately 450 head since December 2001. Prospects for substantial improvement in Cuba’s livestock sector are directly linked to U.S.-Cuban relations. In a free-market Cuba, U.S. livestock exporters would have an advantage over most other country exporters. The vast size of U.S. breeding stock, high level of technology in animal reproduction and physiology, advanced research on improved pasture grasses and animal feedstuffs, past experience of U.S. livestock interests in Cuba, and other factors will ultimately affect the livestock industry in Cuba. Alimport has indicated Cuba would buy 100,000 head of cattle when U.S. restrictions are removed.18 Based on an average price of $1,800 per head, the potential market in Cuba for U.S. cattle exporters could reach $180 million. Cuba, following the revolution, turned to capital intensive agriculture. Many farms were nationalized and administered as large-scale state farms requiring financing of production inputs. Emphasis was placed on irrigation, mechanization and the use of current technology. Under the scenario of free trade between Cuba and the United States, prospects would be favorable for substantial exports of U.S. production requisites to Cuba. 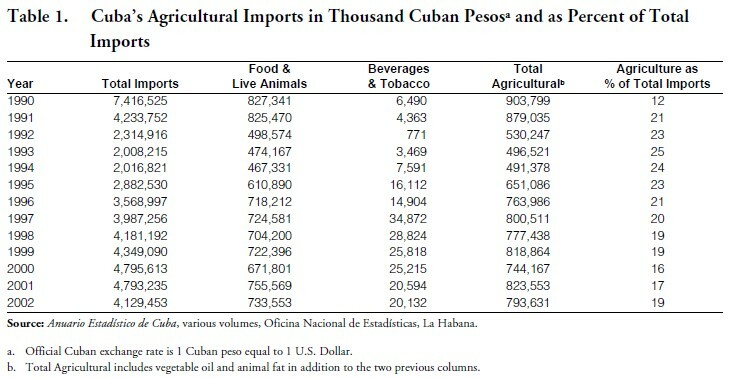 Data for Cuba’s agricultural-input imports in 1989 serve as an indication of Cuban requirements in the future short run, assuming Cuba could obtain sufficient credit. A longer-run future market for U.S. exports may depend on U.S. and other foreign investments in manufacturing the inputs in Cuba. Various geographic regions of the United States will have opportunities for exporting production requisites as well as other food and agricultural items to Cuba under a scenario of a free-market. Southern U.S. states, in particular, will be in a favorable position to export to Cuba products, such as rice, chicken meat, softwood lumber, and cotton. Under a scenario of high export growth, Texas A&M estimates U.S. exports of these items at more than one-half billion dollars: rice, $300 million; chicken meat, $100 million; softwood sawn logs and plywood, $97 million; and cotton, $12 million. It is apparent there is pent-up demand in Cuba for products of U.S. agribusiness; however, the unanswered question is: will there be effective domestic demand, i.e., will Cuban consumers have the means to buy the products generated by U.S. agribusiness? Answering this question, as well as discussing political and economic considerations that will impact the answer, is beyond the scope of this paper. Conclusions are drawn on the basis of information presented and summarized in Table 4. Lifting the U.S. travel ban to Cuba could increase sales of U.S. food products in the Cuban dollar market. Increased numbers of U.S. tourists, estimated at 1.5 to 2 million U.S. citizens annually within three years of lifting travel restrictions, could create an expanded market for U.S. agribusiness exporters. In addition to the roughly 2 million foreign tourists currently visiting Cuba, lifting the ban on U.S. travelers to Cuba could create a 4-million tourist market in Cuba in a relatively short timeframe. Some displacement of the U.S. food market in the Caribbean could occur, however, the overall impact on U.S. exporters of food and agricultural products would be substantial. Midwest exporters of soybean oil, soybean meal, corn, wheat, pork, beef, and dairy products would be the largest gainers. Exporters of poultry meat and rice from Southern states would also benefit. Manufacturers of branded foods throughout the United States could expect to profit from the expanded market in Cuba. Enacting legislation to lift the travel ban could increase U.S. sales of food and agricultural products to Cuba by $200 million. Exports of U.S. food to Cuba could double the 2003 level to a half-billion dollars or more. Unilaterally removing U.S. economic sanctions on Cuba and not providing incentives for U.S. agribusiness trade and investment, Scenario 2, would have little impact on U.S. food and agricultural exports beyond the anticipated effect of lifting the travel ban. If removing U.S. economic sanctions on Cuba resulted in increased opportunities for Cuba to receive international credit and for the Cuban economy to grow, then a more significant impact could result. There is little evidence to indicate, however, that Cuba would have significant increased access to credit or sustained economic growth as a result of removing U.S. economic sanctions unilaterally on Cuba. In the third scenario, removal of U.S. economic sanctions and a democratic Cuba enacting a market-oriented economy could result in considerable increased trade for U.S. agribusiness. Estimates by the U.S. Department of Agriculture, Texas A&M, and the University of Florida indicate a market in Cuba valued at $1 billion for U.S. food and agricultural products following resumption of normal trade relations. U.S. exports of production requisites, farm machinery, equipment, fertilizers, pesticides, etc., would also rise significantly. Immediate beneficiaries of the new Cuban market would be U.S. exporters of soybean products, wheat and flour, corn, poultry meat and rice. With economic growth and increased per capita income in Cuba under normal commercial relations, a major market could open for U.S. suppliers of livestock genetics and livestock products. Beef, pork, dairy product, poultry meat and egg exporters, especially, would benefit. Refrigeration, which was not widely available in Cuba prior to the revolution, would facilitate a market for these products. Resuming normal trade relations with Cuba could well have a billion-dollar impact on U.S. agribusiness exports in the long term; however, until normal trade relations are re-established between the United States and Cuba, it is anticipated Cuba will continue buying U.S. food as needed to meet basic requirements. Because of lower transportation costs, opportunity to reduce warehouse cost (less time to receive products once ordered), and a competitive U.S. agricultural sector that wants to trade, Cuba could become one of the top markets for U.S. food and agricultural products. Another factor, less obvious, is that Cubans and tourists are familiar with U.S. brands and appreciate the quality of U.S. food products. 1. Portions of the paper are excerpted and updated from a paper presented at the “Whither Goes Cuba?” symposium, Iowa University, February 6-7, 2004, to be published in the Journal of Transnational Law and Contemporary Problems. 2. Economic Commission for Latin America (ECLA), Economic Survey of Latin America (1963), p. 273. 3. Data released by the U.S. Department of the Treasury indicate that agricultural exports to Cuba by foreign subsidiaries of U.S. companies had been significant. Licensed subsidiary trade for Fiscal Year 1992 totaled $499 million; 82% was U.S. subsidiary exports to Cuba and the remaining 18% consisted of U.S. subsidiary imports from Cuba. See Office of Foreign Assets Control, Special Report— An Analysis of Licensed Trade with Cuba by Foreign Subsidiaries of U.S. Companies, U.S. Department of The Treasury (July 1993). 5. 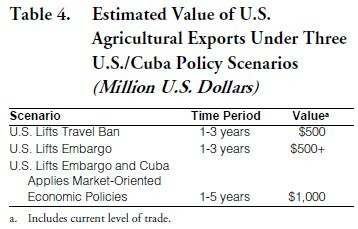 Cuba Policy Foundation, Estimated Agricultural Economic Impacts of Expanded U.S. Tourism to Cuba, www.cubafoundation.org, Washington, D.C., February 2003. 6. Cuba Policy Foundation, Estimated Agricultural Economic Impacts of Expanded U.S. Tourism to Cuba. 7. James E. Ross and María Antonia Fernández Mayo, “Cuba’s Dollar Food Market and U.S. Exports,” Cuba in Transition—Volume 13. Washington: Association for the Study of the Cuban Economy, 2003. 8. Parr Rosson and Flynn Adcock, Economic Impacts of U.S. 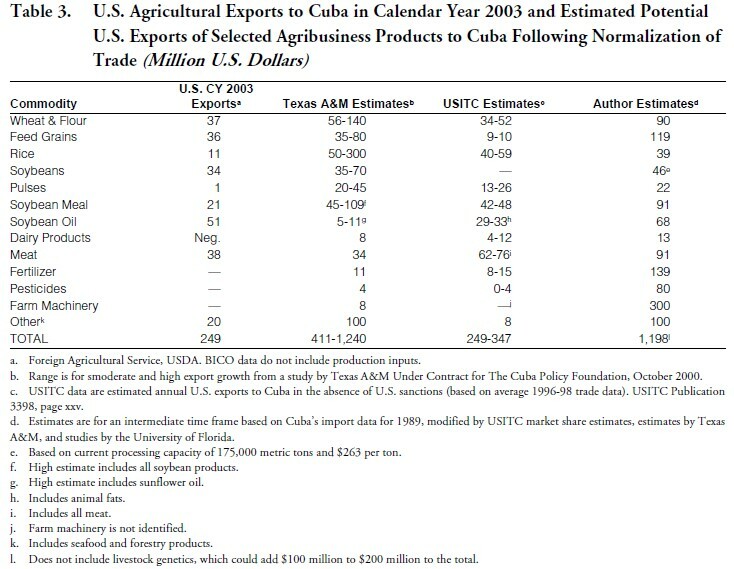 Agricultural Exports to Cuba, Texas A&M University, Center for North American Studies, Department of Agricultural Economics, October 2001. 9. U.S. International Trade Commission, The Economic Impact of U.S. Sanctions with Respect to Cuba, USITC Publication 3398 (February 2001). 10. Craig A. Ratajczyk, Impact of the Embargo on Cuba on the US Soybean Industry, American Soybean Association (2000). 11. FASonline, available at http://www.fas.usda.gov/info/factsheets/cuba. 12. FASonline, available at http://www.fas.usda.gov/info/factsheets/cuba. 13. Jeremy Mattson and Won Koo, Potential for Agricultural Trade With Cuba Under a Liberalized Environment, Center for Agricultural Policy and Trade Issues, North Dakota State University, Newsletter 2 (July 2003). 15. FASonline, available at http://www.fas.usda.gov/info/factsheets/cuba. 16. James E. Ross, “Market Potential for U.S. Livestock Genetics in a Free Market Cuban Economy,” Cuba in Transition—Volume 10. Washington: Association for the Study of the Cuban Economy (2000), p. 108. 17. Foreign Agricultural Service, U.S. Department of Agriculture, BICO data. 19. 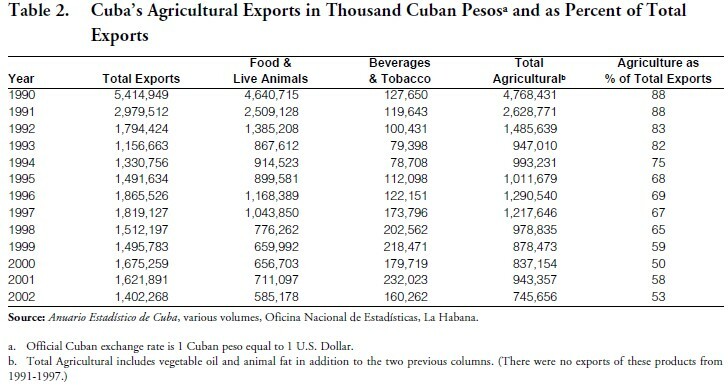 Jose Alvarez and William A. Messina, Jr., Potential Exports of Florida Agricultural Inputs to Cuba: Fertilizers, Pesticides, Animal Feed and Machinery. IW92-33, University of Florida, 2-10 (1992). 21. Data on imports of production requisites are converted from pesos at the official rate of one peso per U.S. dollar.